Japan’s ancient art of paper folding has inspired the design of a potentially trailblazing “smart” radiator that a NASA technologist is now developing to remove or retain heat on small satellites. 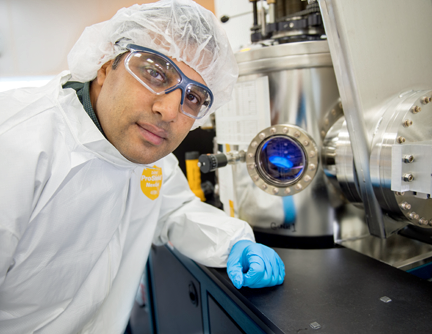 Technologist Vivek Dwivedi, who is standing in front of a sputtering reactor used to deposit vanadium-oxide onto sample substrates for testing, is collaborating with Brigham Young University researchers to develop a radiator ideal for small spacecraft. Photo is courtesy of NASA/W. Hrybyk. 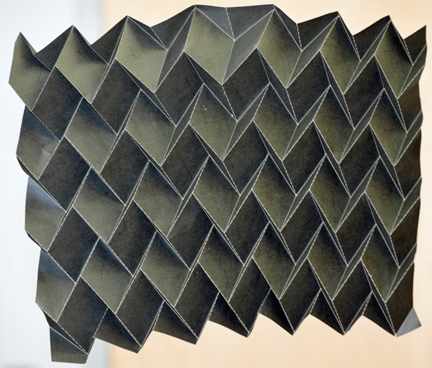 Vivek Dwivedi, a technologist at NASA’s Goddard Space Flight Center in Greenbelt, Maryland, has teamed with a couple of researchers at Brigham Young University in Utah to advance an unconventional radiator that would fold and unfold, much like the V-groove paper structures created with origami, the art of transforming a flat piece of paper into a finished sculpture. NASA’s Center Innovation Fund, or CIF, which supports potentially groundbreaking, high-risk technologies, is funding the effort. Under the partnership, Brigham Young University assistant professor Brian Iverson and doctoral student Rydge Mulford are advancing the design of a three-dimensional, foldable radiator, while Dwivedi is developing a coating to enhance the radiator’s heat-shedding or conservation capabilities. This novel radiator controls the rate of heat loss by performing shape-shifting maneuvers. The resulting topographical changes could be achieved with temperature-sensitive materials like muscle wire or shape-memory alloys. As temperature-sensitive materials experience a change in temperature — caused by spacecraft electronics or the absorption of heat from the Earth or sun — the radiator could automatically change its shape to either shed or conserve heat. The deeper the folds or cavities, the greater the absorption, explained Mulford, adding that scientists have investigated the use of cavities to affect heat loss for nearly 100 years, but no one has approached the challenge in quite this way. “Origami allows you to change the depth of these cavities in real time, thereby changing the heat loss from a surface in real time,” he said. The team, however, wants to take the concept one step further. Brigham Young assistant professor Brian Iverson and doctoral student Rydge Mulford have teamed with NASA technologist Vivek Dwivedi to advance the design of a three-dimensional, foldable radiator, inspired by the art of paper folding. Still early in its development, Iverson and Mulford are experimenting with different shapes to determine which configuration would work best as a radiator. Photo is courtesy of Brigham Young University. Dwivedi, meanwhile, is working to advance a highly emissive coating principally made of vanadium oxide, a transition metal oxide. Dwivedi’s idea is to then apply the special coating on the origami radiator. He also is investigating its potential use on other spacecraft components, including solar-array panels.In testing, vanadium-oxide has shown that it transitions from a semiconductor to a metal state when it reaches 154 degrees Fahrenheit. The changeover causes an increase in emissivity, Dwivedi said. Because satellites encounter wildly fluctuating temperature changes on orbit, Dwivedi’s goal is to lower the transition temperature. In collaboration with Raymond Adomaitis, a professor at the University of Maryland in College Park, Dwivedi plans to lower the transition temperature by applying very thin films of silver and titanium to the vanadium-oxide using sputtering and a technique called atomic layer deposition, or ALD. ALD is performed in a state-of-the-art reactor developed by both Dwivedi and Adomaitis. With ALD, engineers literally can apply atomic-sized layers of different materials onto intricately shaped structures — much like how a cook layers different ingredients to make a pan of lasagna. “The combination of origami and a vanadium-oxide-based coating would be the first time two different variable emissivity devices have been combined into one structure,” Iverson said. By combining both technologies, the team believes it can create a smaller, more efficient radiator ideal for use on CubeSats, tiny spacecraft that are growing in popularity due to their relatively low cost. Such a radiator, Iverson said, could be easily attached to any spacecraft surface where heat needed to be rejected. While early in its development, the origami radiator couldn’t come too soon, particularly for use on CubeSats. Traditional radiators typically are flat and heavy, not lending themselves to installation on a satellite measuring as little as four inches on a side. For more Goddard technology news, go here.